With Diggers state of the art powder coating facility, they offer AAMA 2604 powder coatings in a variety of satin, fine textured, and multi-colored finishes. Aluminum ornamental fencing is an economical and maintenance-free solution to add sophistication and elegance to your yard. Digger offers a lifetime transferable warranty and is made in the United States. Click here for Courtyard styles and colors. 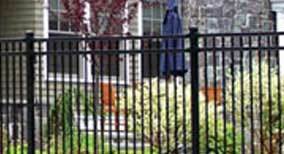 Ameristar’s Montage line of ornamental fence is the leader in residential steel fencing. 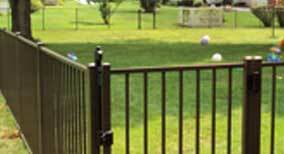 Steel fencing is popular among homeowners who are looking for additional strength over aluminum ornamental. Residential Montage has an e-coat, maintenance-free finish and a 20-year warranty and is made in the United States. Click here for Ameristar styles and colors. Choose Hohulin for Your Residential Ornamental Fencing! If you are considering purchasing residential ornamental fencing for your home, talk with our team of fully trained fencing professionals today. Contact us online or call us at 309-316-1008. For other residential fencing options, see our following pages: Chain Link Fencing, Vinyl Fencing, Ornamental Fencing, Simtek Fencing, and Hot-wired Fencing. For more residential products, please visit our pages on Residential Kennels, Gates & Operators, and Residential Railings.